In ‘07/08 Bayern stocked up on players like Franck Ribery and Luca Toni and they all came together to return Die Roten to the top of the Bundesliga, the DFB-Pokal, and perhaps most important of all, got back to UEFA Champions League competition. They’ll do it in deepest blue, although the Reds reckon their new kit has nothing whatsoever in common with the color preferred by city rivals, the Blues of TSV 1860. "We went for this colour because we thought it was fantastic," commented general manager Uli Hoeneß. "Manchester United, whose club colors are red and white, have a similar range of kit. And they have fierce local rivals who play in light blue, namely Manchester City. That was always somewhere in the back of our minds, and when adidas showed us this kit, we fell in love with the colour. And now, here it is," Hoeneß continued, going on to shed some light on the selection process for a new kit. "adidas present us with a recommendation, which we discuss at board level. We then share our thoughts with the coach and fan club representatives.“ In the current case, 13 months passed between the first presentation and the kit becoming available in fan shops. Bayern have now worn adidas kits for the last 40 years. Some years ago, the Herzogenaurach-based sports equipment manufacturer took a ten percent stake in holding company FC Bayern München AG. "It's a perfect partnership, even more intense now that it ever has been, and characterised by huge mutual trust," commented chairman Karl-Heinz Rummenigge. This new shirt also features a super sleek diagonal mesh weave down the front, plus it’s made with ClimaCool® - the advanced material engineered to reduce heat and moisture build-up, allowing increased comfort and performance. The jersey looks pretty darn good, as you can tell. 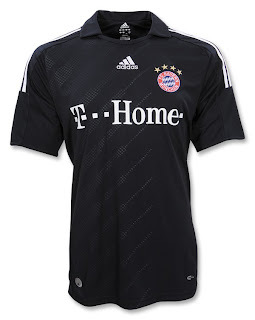 It won’t look as good on you (or any of the Bayern players) as it does on the dancing models in the video, but who does?